I used 2 vintage French fabrics and a vintage English fabric on the back. The batting is a very thin batting called "quilt lite", 100% woven cotton - which looks a little like a loosely woven wool. I'm in the US and am very interested in this batting - do you know a brand name or a mail order source? Seriously love your quilts. Hi Gretchen, the product is called Vilene Quiltlite. It was traditionally used as a facing in men's suiting - in the jacket front. It looks like a loosely woven flannel. I'll take a picture and post it. It's 100% cotton and drapes beautifully. Also good if you have arthritis as it is quite thin and very easy to quilt. I just got your book and was making templates for the "dancing dollies", but can't find the star D (like a seastar)and the heart anywhere. Under Tips & Instructions, at top of page, you will find the download for star and heart along with a correction for pattern piece J. 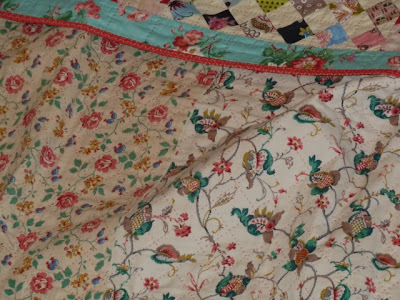 Where do you buy all the beautiful vintage fabrics you use? I am based in London UK and also regularly visit my sister who lives in the South of France. 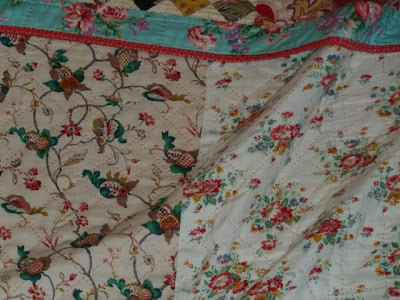 I am just wondering whether you have any tips for where to look for vintage fabric, or know of any good websites or shops where I can buy some. Loving the book, it is such a joy. Do you need to cut off the selvedges when you join quilt lite?